The topic of General Ledger distributions for Sales Order Processing transactions has been known to cause a fair amount of confusion for Dynamics GP users. I would like to address some of the typical questions we receive on this. Please click on the screen shots to see them larger/clearer. Question: Why are there no distributions for Inventory and Cost of Goods (COGS)? Answer: The distributions for Inventory and COGS are always based on the cost of the inventory items at the time the invoice is posted. Since the cost can keep changing with other transactions being posted, GP does not actually calculate the cost (and thus the Inventory and COGS distributions) until the invoice is posted. Question: If I expand the line item to see more detail I see a cost, but it’s not correct. Why is that? Answer: This cost is filled in at the time the invoice is created. This is informational only at this point and will not be what is used as the cost when the invoice is posted. At the time of posting the cost will be recalculated. Once posted, if you look at the invoice and drill into the detail, it will show the correct cost the invoice was posted with. Question: How do I see what GL account numbers will be used for Inventory and COGS when the invoice is posted? Question: Can I change these distribution accounts? Make sure to say Yes to this. Question: How does the system decide what GL account numbers to use? Important note: Changing any of the setup options will not have any impact on already saved transactions. Question: I am getting an error saying something similar to “This Sales distribution amount is incorrect and will not be posted. Do you want to save with errors?” What cases this and what do I do? You are missing setup information so GP cannot determine what accounts to use. You have manually changed something in the distributions and it does not conform to the totals that GP is expecting. Subtotal: all the SALES distributions must total up to a credit equal to the Subtotal. Trade Discount: all the TRADE distributions must total up to a debit equal to the Trade Discount. Tax: all the TAXES distributions must total up to a credit equal to the Tax. Amount Received: all the CASH distributions must total up to a debit equal to the Amount Received. On Account: all the RECV distributions must total up to a debit equal to On Account. You can find a complete list of all the distribution types and their explanations in Accolade Publications‘ Understanding Sales Order Processing book. My 2 cents: For me one of the main benefits of using a product like Dynamics GP is that it can do a lot of the work for you. If you are finding yourself changing the GL distributions for Sales Order Processing transactions frequently (or need to often go back and reclass), I would recommend a review of your setup. In most situations the setup can be done so that you will not need to make any changes to the distributions for 99% of your transactions. Not sure if this blog is still active or not, but I have a perplexing problem related to this post. My company uses the drop ship check boxes, is there a reason why if the drop ship check box is checked and a cost is entered why it wouldn’t flow through to the gl? The COGS amount has to match what was booked to the Drop Ship Items account from the Vendor invoice, or that account will never reconcile. We have some tax distribution accounts that aren’t automatically populating. I checked the Tax Detail Maintenance and the account is set there, but it’s not being populated when an invoice with that tax detail id is created. We are manually typing it in after the invoice is created, but after manually typing it in, if I press “Default” it is cleared again indicating that there is still a problem for future invoices with this tax detail id. I’m not sure where else to look and would appreciate any insight. This is pretty difficult to troubleshoot without actually seeing it. I would recommend working with your GP Partner to get this fixed. Our GP Partner has never been able to help with these sorts of issues in the past, and we are in the process of transitioning to Dynamics 365 so we aren’t really in search of a better one at this point for GP. I did find that the TaxPostToAcct was set to 0 in TX00201. I have updated that to 1 for all the taxes that were having problems. I am hoping that will fix it. Do you know where to find that TaxPostToAcct field in the front end? I don’t see it in the Tax Detail Maintenance window. I’ve not seen that ever be anything other than 1. Do you have an ISV product or customization that might be doing something different with the taxes? We do an import of sales tax rates via SQL with new rates each month, so it may have been an oversight when adding newer tax rates. It does seem to only be a problem with the newer rates we have entered in the past few months. I’ll check to see if our older scripts for sales tax imports have a different value for TaxPostToAcct. By the way Victoria, I really appreciate your site and everything you do for the Dynamics GP community. I haven’t posted here before today, but I have been using your blog for probably 10 years or more and it has saved me countless times. Thanks again for your replies and incredibly useful site. The short answer is that your controller is correct, you can either use the accounts from the customer, which will be one account per invoice, regardless of items, or use the accounts from the items, which can be different for each item. The longer answer is that there are many creative ways to accomplish correct coding for GL accounts. I don’t mean to brush you off, but it’s really not something that I would attempt to solve in a blog comment. You need to have an in-depth conversation with someone knowledgeable about GP setup so that you can explain to them what you want to do and they can help you determine if GP can do it and/or if there is a 3rd party or customization needed/available to accomplish what you need. Same for purchasing, there are several different ways of setting things up and they will vary greatly depending on your specific situation. Hi Victoria! Love the blog. I’m a newbie to GP and have a question about Freight. Is it possible to change the account used for Freight to a Depatrment Code based on the Customer ID? I’ve looked everywhere but I’m stumped. Thanks! In out-of-the-box Dynamics GP you can only specify the Freight account at the company level, so short answer – no. You would need a customization or 3rd party product to accomplish this of you wanted to use the Freight amount at the bottom of the invoice. Alternately, I have seen companies set up an item (or multiple items) for Freight and then add it as a line item to invoices instead of using the Freight field. That could offer some additional options for you, but you would need to test that out and see if it works with the rest of your GP workflow. Hi again Victoria. I have what is hopefully a quick question. We have multiple stores that use a POS system that will be integrated with GP on a nightly basis. Sometimes registers will be over or short cash at the end of the day. Where is this information typically entered in GP? Thank you so much for your help! There is really no such concept in GP as over/short on cash, since there is no ‘cash register’ concept. That said, I always say that the easiest way to deal with situations that are not specifically provided for with GP functionality is to break down what needs to happen at the GL level. From there you can decide whether to simply enter it in the GL, or if you need to involve one of the subledgers. For example, let’s say you’re $1.25 short on cash on a particular day. What needs to happen? We need to decrease (credit) Cash by 1.25 and the other side of that is a debit of 1.25 to an account you likely already have for this called something like Over/Short on Cash Register, or whatever makes more sense in your business. We could simply make a GL entry to record this. That’s one option. However, let’s think about subledgers in GP. If you are using the Bank Rec subledger/functionality in GP to reconcile your Bank Statements, a GL entry may not be the best option, since the Bank Rec module will not know anything about GL entries. In this case you can enter the same thing as a Bank Transaction – it would be an Increase or Decrease Adjustment, one side is the Cash account, the other your Over/Short on Cash Register account. This is probably what you want, as most companies are using Bank Rec in GP. Of course, this is all generic. I don’t know your business or how your GP is set up. Your GP partner should be able to suggest the best solution for this situation given their knowledge of your specific circumstances. And it may differ from what I am suggesting. I am new to GP and your blog posts have been incredibly helpful. I have a question about Sales Transaction Entries…does it ever make sense to have each transaction be a separate entry (with a unique Document # but with the same Batch ID), as opposed to having every transaction for that day on the same Document? I suppose it depends on what you’re trying to achieve. If you’re sending invoices to customers, each transaction has to be separate. If you need to keep track of separate customers and who bought what, again, each transaction should be separate. But if you are simply re-entering sales made elsewhere, for example, at a retail store, there is typically no reason to have multiple transactions, simpler to enter one per day (or even month, for some businesses). Thanks so much for your quick reply, Victoria. We are entering sales from our POS system, via an automatic integration. Since it sounds like either way will work, I am trying to figure out which way makes reconciliation the easiest. Any other insight you have on this would be much appreciated! Without seeing the details of what you’re doing and what you need to reconcile to, this is really difficult to give advice on. Have you asked your Dynamics GP partner for help on this? They may be in a better position to help you answer this. Thanks Victoria! Contacting our GP partner will be my next step. Out-of-the-box GP will let you make and same changes. If your changes are not saving, I suspect there is a customization or 3rd party product causing this. While the SOP setup requires a choice of Posting Accounts from Item OR Customer, is it possible to select one and have the other option apply to certain circumstances? For example, we have a customer set up for “selling” inventory items to the Marketing Department. Because we track COGS by item, we appropriately have the default posting accounts come from the item. However, we want these marketing items to post to Marketing Expense instead of COGS. As far as I know, that means we have to change distributions for each item on the invoices. Is there a way for this customer to override the Item distributions with Customer distributions? You cannot do what you’re asking without either a customization or possibly a 3rd party product. I am stumped. I have a cash receipt transaction that is defaulting to the incorrect AR account. The correct account is set up on the class (and customer). If an invoice was created with the wrong AR account, does the cash receipt take it out of that account used on the invoice, regardless of what is set up as a default on the class/customer? Or alternatively does the checkbook have an AR account default? When you apply a cash receipt to an invoice, the invoice AR account is used for the cash receipt. If you don’t want this to happen, you can post the cash receipt without applying it to an invoice first, then it will use the AR account on the customer. After posting the cash receipt, you can apply it to the invoice. I absolutely cannot figure out a weird integration issue. I am integrating Sales Transaction data into GP – Live and Test databases. Exact same integration and data for both. The Header contains the line item descriptions, all of which end in a date. For example “XYZ Sales 05/01/2015”. In the sample data I’m uploading there are 8 line items, all with dates in May. When I print the resulting invoice from both databases, the Test database’s line items have all been sorted by the data part of the line item description – which is what I’m looking to see. But in the live database, the exact same data appears not be sorted at all. So it looks like the integration is fine, but why would both databases organize the same data differently? Not sure if this will help, but have you seen this KB article: https://support.microsoft.com/en-us/kb/924857/en-us? Thanks for the quick reply, Victoria! I will look into that! Yep, that worked. Apparently this is a client machine based solution, not a server-side one. Thanks, Victoria!! I have a situation where a Return will not post. The error says “This Cost of Goods Sold Distribution amount is incorrect and will not be posted.” I reviewed your article above and all of the numbers match, and I clicked on “Default” in the Sales Distribution Entry screen. I’m not sure where to go next. Try reconciling the transaction (Microsoft Dynamics GP | Tools | Utilities | Sales | Reconcile – Remove Sales Documents). Make sure to only select the one return in the From and To. Sometimes that will fix this issue. If not, this may need to be fixed directly in SQL, which is not something I would feel comfortable advising on unless I could see your data. In this case you might be better off deleting the return and re-entering it. I’m not sure if this will be seen, but it seemed worth a shot. I have a return transaction and the original sale transaction that have brought up an issue I don’t understand. The product cost (offsetting COGS and Inventory accounts in the distribution) are different between the two transactions. I would expect that the product cost would be the same. If it left our inventory at one dollar per unit, why in the return would it be different from that original cost? What inventory valuation is the item set up to use? FIFO perpetual. We think we found it (working on confirmation now), and are hoping to perhaps find a setting that can be changed. The inventory valuation for the incoming return is being pulled from the last POP receipt of the item. It doesn’t make immediate sense to me why this would ever be desirable, but there it is. Even more oddly, it seems to be the last POP receipt in any location. So, we have the following series of transactions. Item A is received at cost X in location 1. Item A is sold at cost X in location 1. Item A is received from a PO at cost Y in location 2. 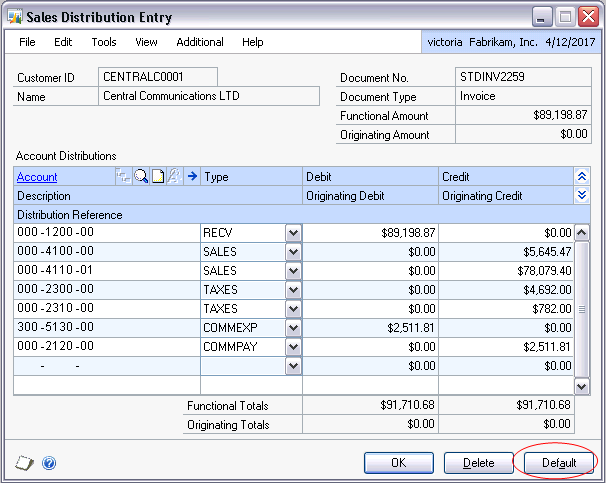 Item A’s transaction 2 is returned using the valuation cost Y from transaction 3. So, the exact same inventory is valued differently than it was when it was originally sold. Yes, what you describe is correct. Here is the problem – how does GP know which sale the return goes against? If you were using serial or lot numbers that may address it, but might be much more cumbersome for data entry. The only think I can think of is allowing the user to override the unit cost on returns (this is an option when setting up the SOP Document) and then manually entering the correct cost every time. You are correct. Our inventory with serial/lot information does not behave this way. I am a GP newbie, and I assumed that the returns transaction would be linked to a sales document, as one should not exist without the other. Thanks for the convo! Your blog has been very useful. Hi Victoria, I’m trying to troubleshoot a sales order that will not post. I’ve created sales orders, back orders, and invoices and non will post. GP displays a blank sales posting journal (all zeros, no accounts). I revisited my sales transaction entry pages and the “Distributions” button is grayed out on all of the orders. Any advice? Based on what you’re describing it sounds like there is a bigger issue – possibly with your GP installation. I would recommend working with your GP Partner or with Microsoft Dynamics GP Support so they can look at your computer and diagnose the issue. I cannot think of any way to do this out-of-the-box, there are no settings in GP to base anything on the tax detail or shipping method. You would need to customize this to accomplish what you’re looking for. It should not be too bad, we have done similar customizations before, however, make sure to take into account both the line item accounts as well as the summary, already calculated distributions when creating your customizations. Thank you for all of this great information, it is very helpful to a non accountant dealing with technical issue. My concern is the TRXSORCE column in SOP10102. I would like to use a string to mark these rows as inserted manually by this process. Is this possible or should I use the existing value for each invoice that is present in the table? I would strongly advise AGAINST updating posted transactions in this way. There are many other tables in multiple modules where transactions are propagated to once posted in SOP. You will be throwing the data integrity of all those transactions out the window by doing this. Inserting transactional records directly into SQL this way may also cause your GP system to be ‘unsupportable’. Another option for late fees is to create a new transaction, just for the late fee, then ‘associate’ the transactions together when printing them. There are probably a few different options and you may want to collaborate with your GP partner to find the best approach. I appreciate the response and advice, unsuportable is definitely not an option. I have actually identified about 20 tables using SOPNUMBE, DOCNUMBR, CUSTNMBR, and TRXSORCE columns accross database using specific data to find populated values. I am performing the testing of this process in a DEV environment at this time. I have adjusted a single invoice and was able to apply payment to it and see the records update across these tables as well as others. Creating another transaction is not an option, we will need to revert to returning all of these invoices and reissuing new invoices with the late fee populated with actual dollar values. Taking your advice on this one. Too many tables found and probably don’t even have all of them. Thanks again for all you do for us. Glad to help, and thanks for your kind words! but its not available that Transaction. This is very good article which you provided. Hi! Victoria. I just want to ask, if you know where the GP picks the Unit Price for an Item on Sales Transaction Entry. It is dependent also on Customer ID entered? Thanks in advance. No way to answer this generically, as this really depends on how you have set up your pricing. Standard Pricing looks at the Price Level, which can be set up by Customer, although most companies do not do this. Extended Pricing can be set up by Customer, as well, but does not have to be. Thanks Victoria. Just for example that we are using Extended Price Level always, on what table and fields on GP, does the Unit Price comes? Because it is automatically generated upon entering an Item Number. I try, if I could find it on GP tables and fields but no luck. Please help, if you have any idea, where I could find it on the database. If you mean where is the unit price stored, it will be in the SOP10200 table. If you mean what Extended Pricing tables does GP look at to calculate the unit price, I cannot answer that. If you are not able to determine this using something like SQL Profiler, you may want to talk to Dynamics GP Support to see if they can help you with all the questions you have on Extended Pricing. What I mean is where the GP look to calculate the Unit Price, because it is automatically populated upon entering of Item Number. Anyway thanks again. I will try your suggestion, but if you have any idea on this, please let me know. 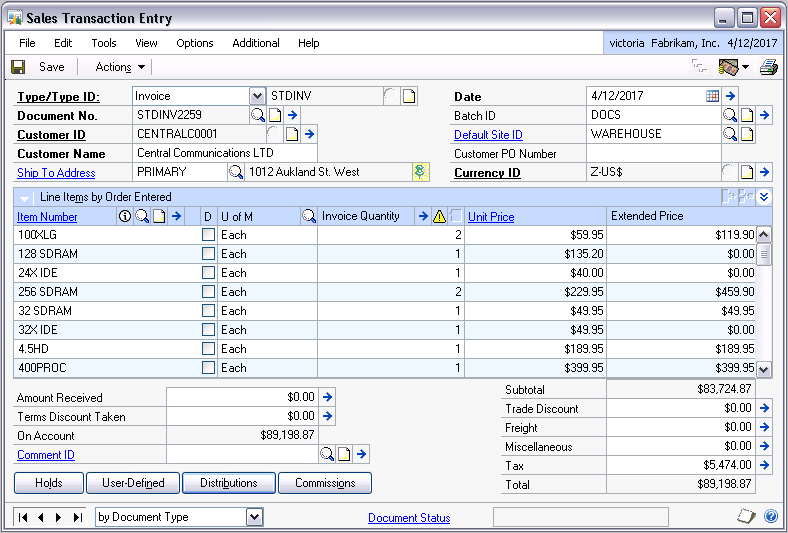 I have an issue; in my GP2010 system- sales transaction entry and purchase reciept entries are posted automatically. The users only save it, but it gets posted. Is this any setup issue…? There is nothing in GP out-of-the-box that will post actual sales invoices or purchase receipt transactions automatically, no matter what your setup. There are some things that will print what looks like a posting report – for example voids or deposits received on sales orders. I would recommend working with your users to monitor what they are doing and seeing what is actually happening. If you have any customizations, examine those to see if they could be causing unexpected behavior. Hi Victoria. We are receiving an error in Sales Transaction Entry when entering a return: “This Cost of Goods Sold amount is incorrect and will not be posted. Do you want to save with errors?” I believe GP thinks this return has been entered in Returns Processing module, however, we are not registered for this module; we are entering it straight into Sales Transaction Entry. 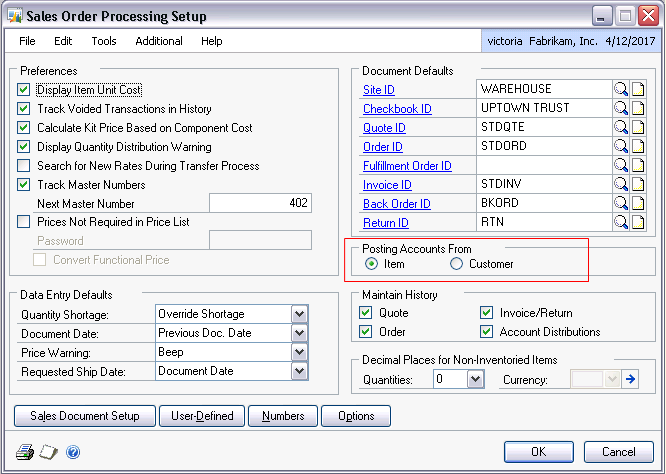 This error is also reproduced when opening an existing return and selecting the Default Accounts on an existing return. I found reference to this error in the knowledge base but cannot find the hotfix: http://support.microsoft.com/kb/869056. Any ideas? That link you’re pointing to is for version 7.5 of Dynamics GP, is that what you’re using? You will not be able to get a hot fix for a version that has not been supported for almost 4 years, at least from MS, nor would I expect that to work for any version other than 7.5. Does this happen to all returns or just one? Have you tried to reconcile the amounts on this transaction by going to GP | Tools | Utilities | Sales | Reconcile – Remove Sales Documents and entering the transaction number in the To/From range? I was wondering it there a way to make Sales Invoice get the line item unit cost from the Item lot number insted of Item Card current cost. What valuation method are you using? I just tested this in the sample company using FIFO Perpetual and the when I post the SOP Invoice the cost is taken correctly from the cost of the lot. I’m using Avarage Perpetual could this be the problem?, if so should it be a problem?!! Also i’m on GP 2010 SP 3 but i searched customer source well there’s no hotfix or a KB about such problem. Yep, that’s the reason and it’s working as designed. Take a look at the definition and explanations for the average perpetual valuation method in the Dynamics GP Inventory manual. You will not find a KB or hotfix for something that is working as designed. In my experience very few business use the average perpetual inventory valuation method anymore. However, this is something that should be decided on by your accountants and/or auditors. OK i will try to change the Item Valiuation method (Tools > Utilities > Inventory > Change Valiuation) on a local copy and see what will happen on SOP. Thanks for your time and efforts will keep you posted on the results. Thanks Victoria change Item Valiuation method fixed it, although in order for the Utility to work right all Trx related to the Item must be posted before using the utility. But i wonder what is the idea behind disable geting the Lot cost if the Item Valiuation Method is Avg. ?! I have a problem with the Sales Invoice’s distribution. I have posted an Invoice , but there is no INV & COGS account distribution for it. What could be the reason?? Please help. – The item was not recognized as an inventory item by GP. – The item type was one that does not post Inventory or COGS. – GP calculated the cost of the item as 0. The question and answers helped me solve an issue with respect to the GL account selected by default in Cash Receipt Distribution entry. Also I refer to your list of tables in the GP database. Thanks a lot for everything. Are you importing the GL distributions? If so, then you will probably need to change the import so it is combining the GL distributions in the way you want. How can post by document and not by item?, our GP posts by item instead of document and is creating a lot of transactions in the database. Where I need to do this change? Are you entering transactions manually or importing them? In manually entered transactions, I have not seen GP post ‘by item’, it should combine entries for the same GL account number by default. I cannot think of a setting for this, it should be doing this automatically. The only posting setting I can think of determined whether to create one GL transaction for each sales transaction or one GL transaction for each sales batch. If you want one GL transaction per batch, you can change that on the Posting Setup window (Tools > Setup > Posting > Posting). Could you tell me exactly which distribution accounts are required for an Invoice posting? Great information. Thanks for writing. I was wondering if there is a way to be sure that an invoice would post the INV & COG. We have a lot of custom and I often find things that don’t work quite right. So I try to catch everything by running exception scripts prior to posting (at night in a batch). I check for unmatched distributions while it’s an invoice but is there a way to see COG before hand? There is no easy way to do this. If you were doing it manually, you would need to go into each item and check the distribution accounts set up for it. Since the sales transaction will not post without the Inventory and COGS accounts it is not a question of whether they are there, but more of whether they are correct. If you are looking to check the amounts that will be used, that is a lot more difficult, since it will depend on the order that invoices are posted and your cost layers at that exact point in time. All in all, not an easy task. My 2 cents would be that rather than checking the distributions before posting, check the setup in GP and the logic of any imports or customizations to confirm they are correct. Set up a test environment and test everything. I know this is sometimes easier said than done, but that is the best way to do it. No, it doesn´t, I also deleted the row and entered it again, the error message is still the same. I found out that the “on order amount” in sales header is different to the invoice amount. I guess it is caused by the copy of the original invoice and the deletion of some rows. What is the transaction type you are looking at? I don’t think the ‘on order amount’ matters at all for invoices. However, other amounts, like markdown, on account, tax, subtotal, etc. will matter a great deal. Typically using the GP functionality to copy a transaction will not cause any issues with these, but I have seen customizations as well as connectivity issues while transferring orders to invoices cause problems with distributions. thanks for the great explanations. 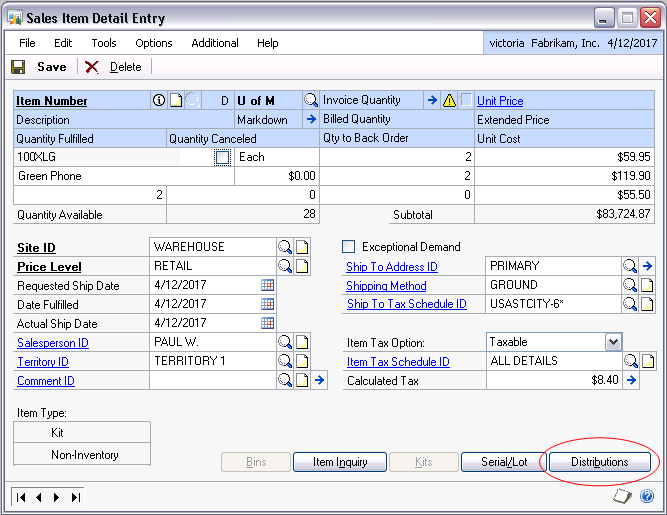 If you click on ‘Default’ on the Sales Distribution Entry window, does that make any difference? There is so much logic going into the posting process for SOP transactions that I truly don’t believe you’re going to be easily able to accomplish what you’re looking to do. And I am not sure VBA is enough, I believe you’re looking at a pretty complicated Dexterity customization. I am unclear why you have to use SOP? Why not just an Inventory transaction? My recommendation would be to re-evaluate what exactly you’re trying to accomplish and see if there is a different way to do it that is not so invasive to the internal logic of GP. It may be worthwhile to pay for some consulting time with someone knowledgeable in what you’re trying to do and GP so they can help you come up with a comprehensive solution. In continuation with my previous post, was just wondering if u knew from where GP picks the cost while posting in SOP. I have customised the post routine, to delete the distribution table and also to mark the extended prices and other amount fields to zero. Also i changed the current cost of the product to zero. Now i c that there are no distri created for sales and recv, but though the cost was manually updated to zero in iv00101 tables, i c it has created distri for inv and cogs. Do u have any idea from where it picks this cost for the product. I even changed the cost in sop10200 tables to zero b4 posting. Thnks for ur immed reply. I am actually doing customised by writing VBA Codes. I wanted to avoid this and think if something the product could be handled with. Anyways, tks for ur assitance. The reason for me to have asked is bcos our co. uses this as the delivery note n not invoice. We book the sales at a much future date, but just want our inventories to be updated. Morover, this would also appear as uninvoiced DN. Much appreciate ur assistance n look forward to more interactions with u. This is just a wonderful post. Got to know many newer things. I have a qn to u pls. I want to create invoices in SOP module but do not want it to get posted to RM or GL Tables but just the inventory module and SOP30200 tables. Is there any way to achieve this? Thanks for your early reply. Thanks for the kind words! You can stop any transaction from posting to the GL in the posting settings (Tools > Setup > Posting > Posting). However, I cannot think of any way to stop SOP invoices from posting to RM. I suppose just about anything is possible with a customization, but I don’t think this would be a simple one. how to compute for the Inventory and Cost of Good Solds per line item in the Sales Transaction Entry Module? There is no one answer to this…it will depend on each individual inventory item settings for item type and valuation method. For example, for an item of type Sales Inventory and valuation of FIFO perpetual, you’d have to find the older cost layer not sold yet. However, if you have multiple cost layers and multiple unposted sales invoices, there is no way to predict what cost each invoice will use, since it will depend on the order the invoices are posted in. That is an excellent question! I did not notice this before, but I must have picked an Invoice with some back-ordered items. If items are not entered as fulfilled on an Invoice they can still be printed and viewed on the screen, but they will not be billed for, which is what you’re seeing here. why are some of the Extended Price amounts zero in the first screen shot? (Sales Transaction Entry) I’m trying to learn GP and every discrepancy makes one ask “why”. Very very helpful. I am so happy to see a blog directed to Dynamics 10! As usual something from Victoria that is clear and easy to understand. Awesome article Victoria!! This is so useful to users. Just incredible. This is a very good post, Vaidy has mentioned it in his blog. Even I was wondering why this INV&COGS created after the Invoice is posted. The explanation was really clear and good and expecting more in future like this. I saw comments about this article in vaidy’s blog.Now I read out ..It is really very useful. we welcome the more functionalitywise article like it. This is a simple yet complete article on Sales Trx distributions. For instance, I know the INV & COGS account distribution lines are going to be created only when we post the transaction, but I have often wondered WHY so. Thank you so much for such an informative article.